Fr. Cedric Pisegna, C.P. is a Passionist priest who professed vows in September of 1985. He was born in Springfield, Massachusetts and graduated from the University of Massachusetts at Amherst with B.S. in Social Work and a minor in Business. In addition, he has studied Philosophy at Southern Illinois University and has studied Speech and Drama at Northwestern University in Chicago. Fr. Cedric graduated from the Catholic Theological Union at Chicago in May, 1990, receiving his Master of Divinity degree with Bible Specialization. 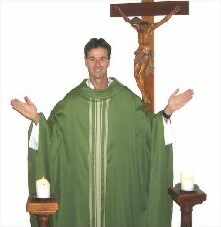 He was ordained a priest on June 29, 1991. Presently, Fr. Cedric preaches retreats and missions throughout the United States and Canada, ministering out of the Passionist retreat complex in Houston, Texas. He has preached over 300 missions for some 20 years. In 1987, he studied Scripture in Israel and Greece and has led pilgrimages there in 1995, 1999, and 2002. In the fall of 2003, he studied theology at the North American College in Rome, Italy. Fr. Cedric's T.V. program Live with Passion! is presently airing nationally and internationally on the Church Channel and other stations. He has produced a number of CD's and DVD's on Christian living. He has also authored 20 books. Father Cedric's missions are well attended. Parishioner at the Venice Cathedral, Venice, FL. From an 8 year old in Conroe, TX. Refresh your people in Christ. (All talks subject to change) Fr. Cedric will touch the hearts of his hearers through story, humor and personal experiences. Expect great things!